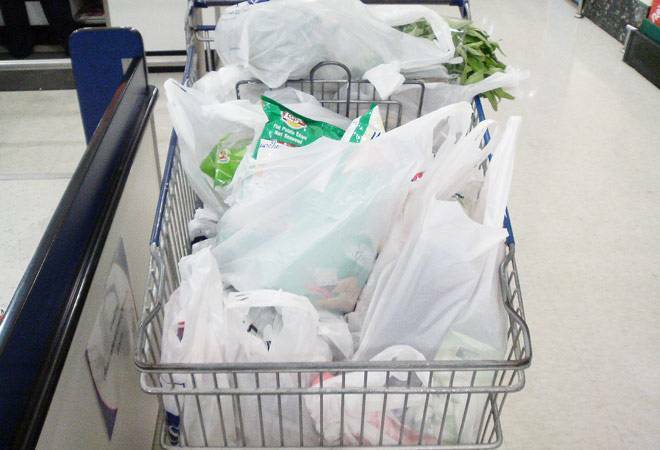 Finally Some Good Sense Prevails for Flexible Packaging! Let me play a devil's advocate for a moment and assume that all that I have mentioned hereinabove is true. Do these packets walk on two legs and get immersed in our water bodies? Let me play a devil's advocate for a moment and assume that all that I have mentioned hereinabove is true. Do these packets walk on two legs and get immersed in our water bodies? Do these packs yell and say 'Hey, please dump me by the roadside so that I could mingle with my siblings coming from other outlets'? Do these packs gang up and find a cosy corner for themselves in our drain holes? The answer is a BIG FAT 'NO'. It is the irresponsible behaviour on part of 'We the People' that leads to such menace and concomitant hazard. It is a known fact that diesel and petrol vehicles are a major source of pollution. Have the diesel and petrol pumps been shut? A knife that is used for chopping vegetables can also be used to slit a throat. Have vegetable cutting knifes been banned world over? To what use we put an available resource is completely our wisdom. It's the choice we make! Nothing can be held responsible for the choices we make. The fault is not of the knife but that of the killer. How can banning of flexible packaging be justified in such a scenario? All that banning exemplifies is a knee-jerk reaction and an extremely myopic point of view. To all those who raise eyebrows for flexible packaging which also comes from the family of plastics/ polymers, I would like to remind that a lot of elegant clothes that we wear and flaunt are also made of polyester fibre and yarn which again comes from plastic. It is quite surprising that nobody complains about it. Had plastic not been invented, many regular, essential and luxury items that you see around yourself and use in your daily lives would have been made from plants either directly or indirectly. If that were to happen, believe you me our earth would have been bereft of its entire green cover. In layman's language that would have left our planet bald and tonsured because no plants and trees would have been spared by man. Today if you see your planet green, it's only because of plastics. One must be grateful to plastic! Coming back to flexible packaging, I ask you a straight in the face question! Will you buy your favourite brand of potato wafers from the supermarket if they are not packed? Forget about buying, will you even recognize in the first place that it is the same brand of wafers that you love munching? No prizes for guessing the answers...right??? So we all unanimously agree that packaging is ubiquitous and can't be done away with. Before we proceed any further let's spend a moment in understanding what multi-layered flexible packaging actually is. This is only going to help us getting the facts right once and for all! Depending upon pack functionalities and barrier properties that a particular product requires, various substrates like polyester, polypropylene, polyamide, foil, paper and/or aluminium foil etc. are laminated to deliver a broad range of protective properties while employing optimized quantity of packaging material. Flexible packaging has the potential of offering superior aesthetics, enhanced functionalities and optimised barrier properties to various consumer products. Packaging for salt for instance will require very different treatment than that for let's say biscuits. Packaging for chocolate will need very different barrier properties than packaging of fox-nuts. Flexible packaging paves way for immense reduction at source. Picture this - Imagine an elegant and a sleek 10 kg flexible pack of basmati rice juxtaposed to a thick pet container carrying same amount of basmati rice. It's a no brainer that the former will require far less polymer as compared to the latter. What's the point of going for a thick rigid PET container when similar protection to rice coupled up with much more enhanced functionalities and aesthetics can be offered to the pack by way of flexible packaging? Research from across the world has proven beyond reasonable doubt that flexible packaging is much more energy efficient (hence leaves much less carbon foot-print) throughout the three critical phases of its lifecycle i.e. Manufacturing, Transportation and Disposal when compared to its rigid counterpart. According to the report 'A Holistic View of the Role of Flexible Packaging in a Sustainable World', published on 09th April 2018 by Flexible Packaging Association (FPA), six Life Cycle Analyses (LCA) were carried out on packaging formats for characterizing impacts associated with the sourcing, manufacturing, distributing, using and disposing of a product or product system. Only primary packaging was evaluated for the aforesaid report. Additionally, the product-to-package ratio as well as the amount of packaging landfilled for 1000 kg of each product was determined. The amount of packaging landfilled was based on recycling rates of each packaging material, while assuming none of the flexible packages were recycled. I am reproducing the results of one of the six LCA case studies that have been discussed in the FPA report. This happens to be for Single Serve Juice Beverage. Please take a careful look at the table presented hereunder. All percentages are shown using flexible package as the baseline. Percentages in red mean those values are less preferable than flexible package, while percentage/s shown in blue mean those values are more preferable over flexible packaging. A normalized product weight (common value divisible by all package formats) of 1,188,000 fl.oz. of product was used for Fossil Fuel; GHG and Water Consumption calculations. For packaging 60 pounds of beverage 50 pounds of glass; 6 pounds of Rigid PET; 3 Pounds of Aluminium but merely 1.5 pounds of flexible packaging will be required. Isn't plastic indeed fantastic? 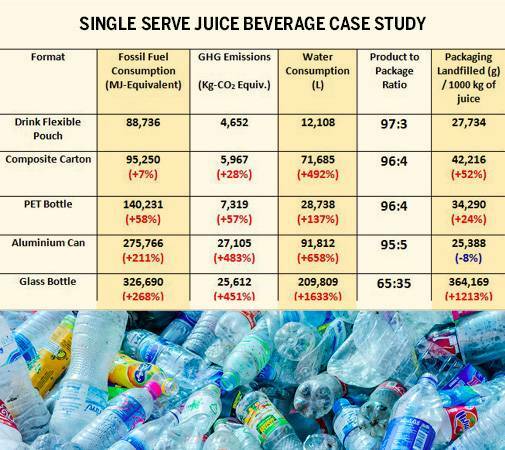 Replacing plastics in consumer products and packaging with a mix of alternative materials that provide the same function would increase environmental costs from USD 139 Billion to USD 533 Billion annually. There is enough credence available publically to allay all doubts about the efficiency and efficacy of flexible packaging. Flexible packaging offers myriad sustainability advantages across the entire packaging value chain, some of them being high product to package ratio; reduced carbon, greenhouse gas emissions and water use versus other packaging formats. Flexible packaging is gaining traction by the days and is fast outpacing other formats of packaging bringing immense value to the entire packaging value chain including manufacturers, brand owners, retailers and most importantly the consumers. One of the most important points that I would like all of you to take cognizance of is, that flexible packaging is perfectly re-processable and can be converted into alternate non-critical and non-food contact materials of utility like chairs, boom barriers, road dividers and several more. We at Uflex accord high importance to sustainability. In fact, innovation and sustainability at Uflex go hand in hand keeping the 'GREEN' Promise by Using renewable resources; Maximizing post-consumer re-cyclate usage; reusing all-production waste; using all non-recyclable waste to produce energy; progressively optimizing energy consumption; optimally down-gauging the substrates and Light-weighting the packaging structures. Our packaging manufacturing facilities are equipped with reprocessing plants where multilayered laminates are converted into polymeric pellets that are further used for making various non-critical and non-food contact utility items. Our Waste to Energy plants (again an integral part of our manufacturing plants) further up-hold our commitment towards environmental sustainability. We are also working towards installing Waste to fossil fuel conversion plant at our Noida precinct soon. Going back to the example of petrol, diesel and kitchen knife that I had cited in the beginning of my editorial, I would like to reiterate that banning of packaging is absolutely no solution. The actual remedy lies in collaborative action by Government, Corporate Houses, Trade Bodies, Academia, Brands, Civil Society Organizations and most importantly Public at large to dispose-off packaging much more responsibly so that it becomes tenable to adopt technologies that further drive collection, sortation and reprocessing of flexible materials. A lot of work has been done by the companies towards downgauging of polymeric films and light-weighting of over-all flexible packaging structures. In fact, there's a limit to how much one can down-gauge in flexible packaging and the industry has by and large plateaued. Now that this low hanging fruit has been plucked, much more institutionalized efforts have to go towards hybrid bio-based materials, greener chemistry replacements, sustainable sourcing and composting (home and industrial) among other efforts to give a much-needed impetus to Circular Economy and Sustainable Material Management. A lot of work is happening across the globe over all of this. At the cost of repetition, I would like to say that the biggest problem in our country related to the topic on which I am sharing my views is waste collection. To address this, the Government could consider imposing some amount of tax on all plastics used in whichever or whatever form. This tax could be called 'Plastic Waste Management Tax'. It should be levied on all producers and brand owners at let's say Rs. 2-3 per kg. This money should be strictly used for the purposes of plastic waste collection and further processing. If this is implemented in letter and spirit, I am of the firm view that India will become the first country that will be free from waste plastic setting examples for others. 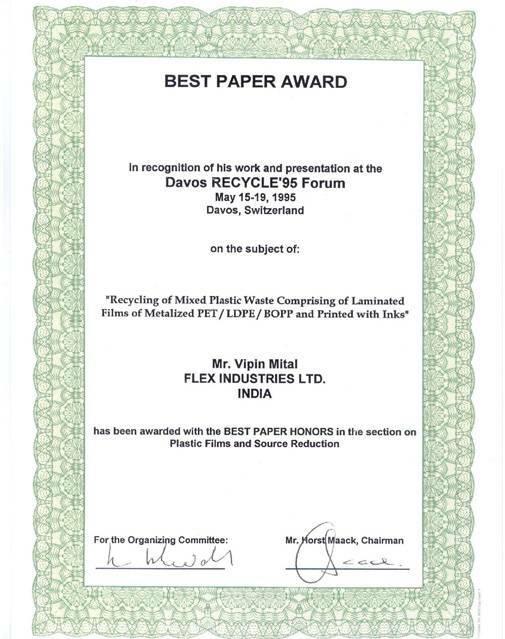 After a long spell of thoughtless brouhaha about plastics which also includes flexible packaging, Plastic Waste Management (Amendment) Rules, 2018 recently notified by Ministry of Environment, Forest and Climate Change in India is a welcome step that acknowledges the merits of multi-layered flexible packaging and ushers us into a whole new era of reinvigorated collaboration fostering partnerships and embracing genuine concern for a triple bottom line approach covering environmental, economic and social aspects. Likewise, the global acceptance of flexible packaging as a sustainable and viable option is also increasing by the days - a fact that is echoed by the rapidly growing share of flexible packaging in the overall packaging pie. India is indeed going great guns and at a time when the entire world looks up to India for emulating good practices, I strongly hope that with the latest notification of Plastic Waste Management (Amendment) Rules, 2018, our Government has set a good precedent for other countries to follow suit. May this good sense prevail!! !